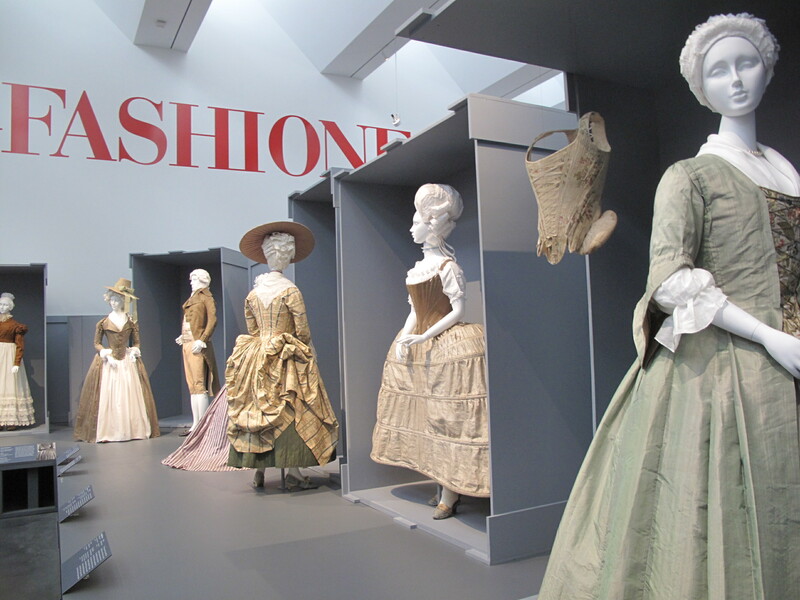 My sister and I have been talking about going to LACMA’s fashion exhibition for months now, an art exhibition on changing European fashions over a 200-year period. We realize it closes soon (next Sunday, March 27th) and make plans to see it the next day. Before we even leave the house, fashion is on our minds. I find myself overly concerned about what to wear. I wonder, “What exactly do you wear to an exhibition on fashion?” I settle for a white shirt, jeans, and a gold-colored vintage necklace and we’re out the door. 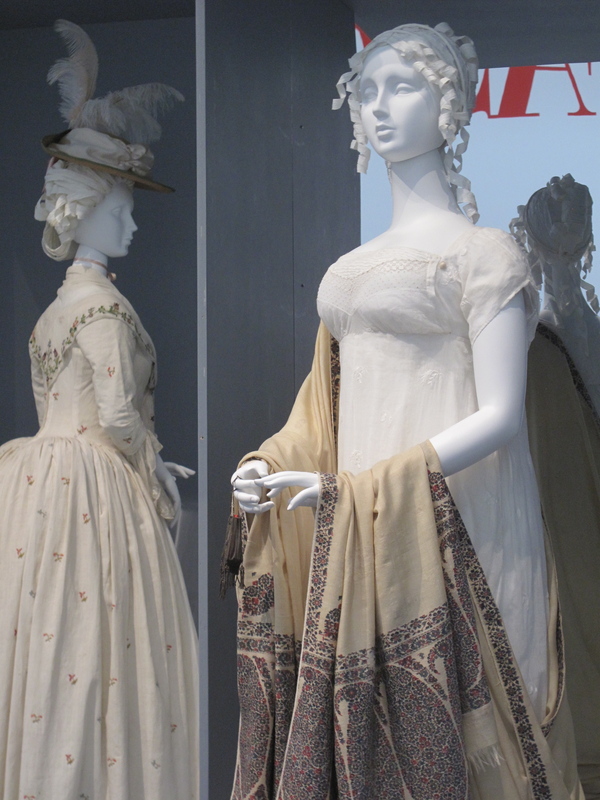 When we enter the exhibition, the clothing I see on display doesn’t immediately register as fashion. Instead the garments seem more like costumes. Images from period films like “Dangerous Liaisons” and “Pride and Prejudice” run through my mind. I take a closer look and see how different the actual clothes of these periods look in real life. It isn’t just the vivid textures of the clothing that strike me. It’s the way light affects the fabrics and their trims. Embroideries made with silver and gold metallic threads sparkle in the gallery lights. The iridescent quality of the silk taffetas are stunning (changing from deep purple to silvery grey on one waistcoat). It’s hard to resist the desire to touch the fabrics, especially the lush velvets. My sister says these garments were the finest of their day, and she should know. She has collected antique fabric, trim, and accessories for over 30 thirty years. She uses her antique finds to make designer pillows and jewelry. 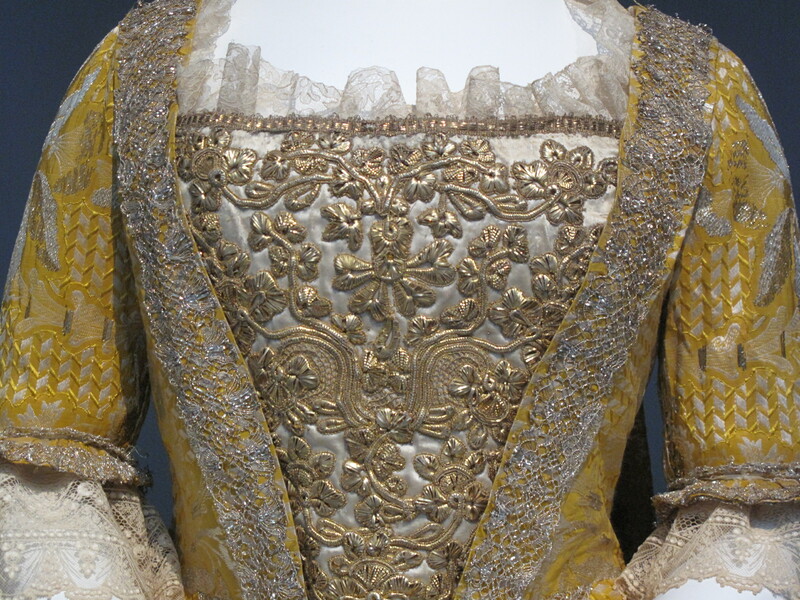 The exhibition has an entire section on trims – we see intricate laces, embroidery, braids, and tassels. In our age of technology, it’s hard to imagine that these were made by hand with only a needle and a thread. One of the advantages of going with an expert is that they give you information and point out details while you’re looking at the objects. Unlike audio guides or tours, this is totally unscripted and in the moment. I love this. It eases the difficulty of trying to toggle between looking at the labels and details of the collection. We learn a lot from the museum labels as well. We read how social and political circumstances of the era influenced what people wore. During the French Revolution, public displays of luxury and fashion were not only politically incorrect, but dangerous. This led aristocratic men to wear working-class trousers. 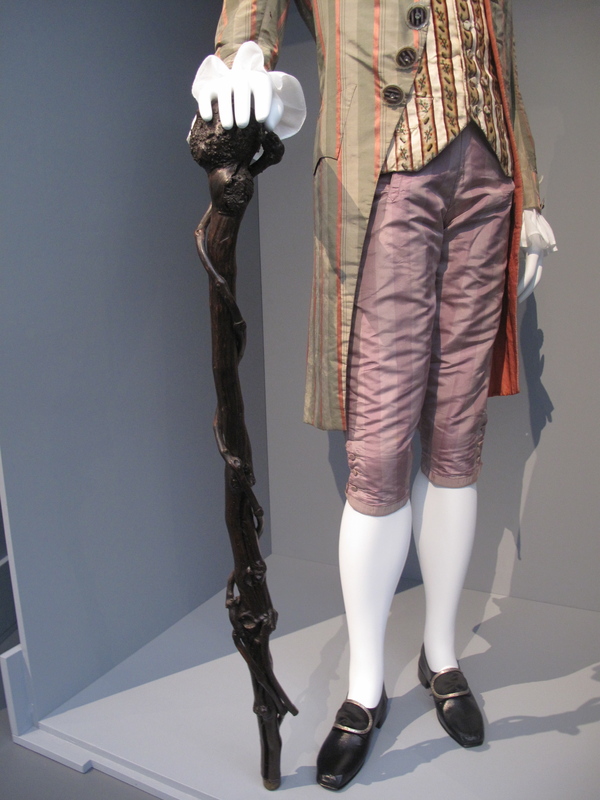 They also carried heavy knurled wood walking sticks to protect themselves against attackers. Concepts of beauty and the ideal female figure influenced not only the shape of women’s clothing, but also their mobility. Women wore stiff constricting corsets and enormous metal hoop petticoats (sometimes as wide as six feet) to meet beauty standards of their time. This makes us curious about the people who wore these garments. Who were they and what were their lives like? 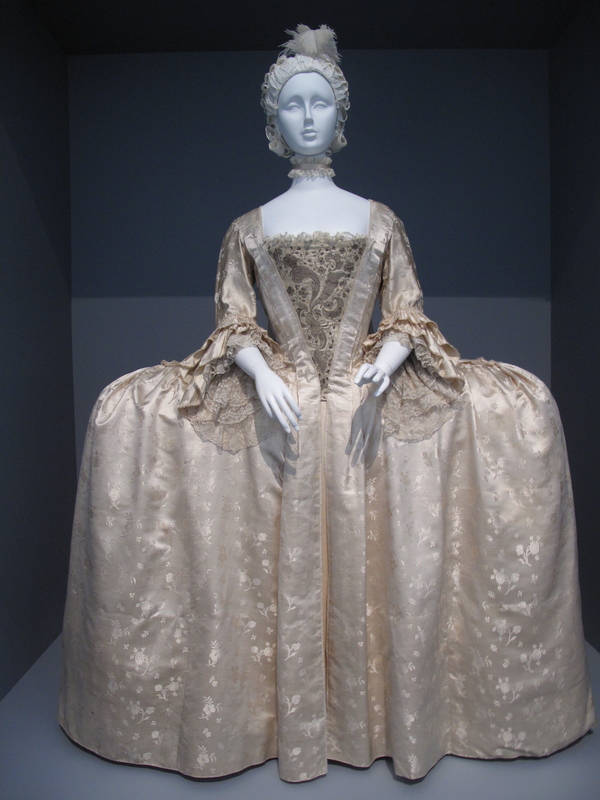 How did women walk, dance, and sit in these gowns? But it isn’t long until the anthropologist in me steps back and starts to wonder about the people in the gallery. It’s Thursday morning so the galleries aren’t crowded. Behind me, I see two women speaking quietly, but intensely, in French as they hover intently over a label mounted on a stand. I imagine they are tourists. Next to me an older woman (nicely dressed I might add) tells me she’s driven a long way to see the show. She says she likes to sew and points to the amazing piece of embroidery in front of her, “but nothing like this,” she adds. Then there are two hip looking men who I think might be designers. Unlike my sister who lingers over every object, they stroll through the galleries at a relatively quick pace. There is a lot to see in this exhibition (over 200 objects). By the time we reach the last gallery it’s lunchtime. We head over to the museum café, order lunch and talk about what we saw. Among other things, we discuss our newfound appreciation for a life without stiff corsets and metal petticoats, and the modern day invention of stretch jeans. From this perspective, the changing tides of fashion are definitely on our side. Looked like a fabulous show. Wish I had seen it.